Nana's goodie sampler care package. When you want them to enjoy some homemade delicious goodies this is the one to send. Great variety and plenty to share. 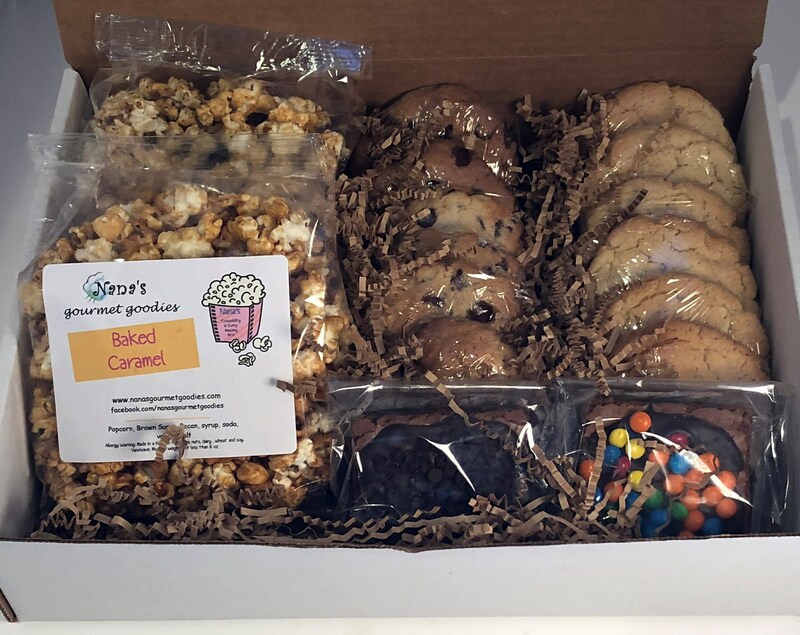 Sampler includes 2 of Nana's Gourmet baked flavored caramel popcorn, 2 delicious gourmet brownies, and one dozen gourmet cookies. Makes the perfect pick me up, brighten their day, treats for studying, corporate thank you, or just because you care enough to send the yummiest of treats. Popcorn flavors may include, gingerbread, happy birthday, hot chocolate, spicy with a kick, cashew,chocolate, strawberry, cracker jack peanut, southern pecan, cookies and cream, dark chocolate sea salt, keylime pie, lime, or caramel. Brownies may include, fudge, mint, caramel pecan, Cosmo m&m, peanut butter & chocolate chip , chocolate chip, and milk & white chocolate drizzle. Cookies with such amazing flavors as M&M, chocolate chip, peanut butter, oatmeal raisin, snickerdoodle, chocolate crinkle and sugar cookie. Delicious, moist and oh so craveable. Will be glad to include a special note for your recipient, please leave message in notes at checkout or mark as gift and leave message. Thanks for shopping Nana's we love baking and serving you.